Once a work enters the public domain, it is no longer subject to copyright laws. A publisher can print their own edition of the Beatrix Potter books, a filmmaker can make a film of any of Shakespeare’s plays, and a game developer can adapt any of the characters, scenes, or even whole stories from public domain works. This is what Inkle did with 80 Days back in 2014. The studio adapted Jules Verne’s Around the World in 80 Days into a marvellous text adventure. Huge amounts of the material is new but the premise of a gentleman betting his club that he can circumnavigate the globe in 80 days is pulled straight from the book. As is the name of the gentleman, Phileas Fogg, and his manservant Jean Passepartout. It’s an excellent adaptation of a story which is still strong in our cultural memory. A game adapted from a book doesn’t have to be a text adventure. Whilst we were writing Kotaku UK’s Adventure Games of 2016 list, a developer told me about one game, Kim, based on the Rudyard Kipling book of the same name. It’s a randomly generated world populated with the characters of Kipling’s book, and you explore the environment, talking to NPCs lifted straight from the pages of a book about British-ruled India in 1901. I’d love to see more developers adapting books into games. There’s a whole library of our greatest stories that’s sitting largely unused on the internet. The Gutenberg Project is an archive of books that have entered the public domain; just glancing through its most popular list, I see tonnes of books that could become great games. Here are seven that came to me. A game of many parts (appropriately): on the one hand you play mad scientist Victor Frankenstein, creating creatures out of different body parts and animating his hotch-potch corpses. On the other, should your creation escape before you’ve had the chance to present it to your peers and win their adulation, you’ll have to chase it down and recapture it (hopefully before it kills anyone). One of the first novels ever written and still one of the richest. It told the story of a lesser Spanish noble, Don Quixote, sent senile by his obsessive reading of books. He began living under the delusion that he was a knight from the romance novels he would read. 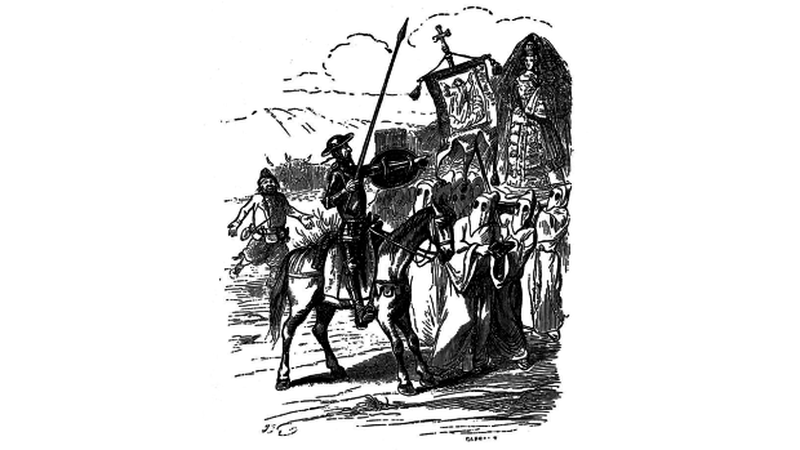 Quixote then set out to undertake quests across the land, but always under a misapprehension. He mistakes an inn for a castle, some monks for evil conjurers, and, most famously, charged a set of windmills he believed were giants. In the right hands this story could become an open world game where you play Don Quixote, trying to solve quests in a world where nothing is what it seems and at any moment can alter and change into an enemy, a friend, or a windmill. If Robinson Crusoe were to be published today you’d say it had come from the mind of someone who had played hundreds of hours of Don’t Starve. It’s the story of a shipwrecked man who washes up on a strange island. He manages to survive by foraging the island’s plants and exploiting the natural resources, trying to survive long enough to find a means of escape. So far, a pretty good setup for a survival game. As a twist on the usual survival game formula, you can encounter, befriend, and train natives to help you in your pursuit. In an entirely unproblematic way that won’t offend anyone, of course. Rather than turn a single one of Jane Austen’s books into a game, all her novels can conceivably inhabit the same world: a world of suitors, debts, mortal illness, and walks in country parks. I don’t know about you but I think this complex social world is best captured by a Crusader Kings-style simulation. Just picture a map of England covered with eligible men and women, all with their own strengths and foibles from a weakness for gambling on cards to a tendency towards loose-lipped gossip. And, of course, one’s family members can cast a shadow over even the most desirable of sweethearts. Somehow you have to navigate your character’s way to security, whether that be in marriage or financial independence. You might know George Bernard Shaw’s play better by the name of the musical adaptation, My Fair Lady. It tells the story of a phonetics professor who makes a bet that he can train a Cockney flower girl the airs and graces of high society so well that she may pass herself off as a duchess at an ambassador’s garden party. What a perfect setup for a game. You have 30 days to prepare your unpolished ward for the ambassador’s garden party. Each day you choose where they focus their time–phonetics, manners, names of the guests, and so on. Sort of like the Persona games, only in Georgian England and with more focus on decorum than turn-based battles. Though, proper etiquette at the dinner table could certainly be handled like a round of Hearthstone. There’s already a game that captures the descent into madness that can accompany a journey of obsession. Instead of a boat travelling deeper and deeper into an African jungle, the game sees you journeying across a glassy subterranean ocean: The Sunless Sea. While that’s a game whose influences are more obviously Lovecraftian, it touches on a lot of the same ideas as the novel by Joseph Conrad. Where the worlds would differ is that there’s no shore leave reprieve to be had in Conrad’s story; any stress gained stays with you until you eventually leave the jungle. If you leave the jungle. Rather than tell the story of Oliver, an orphan trying to survive on the streets of London, a much more interesting character to base a game around would be Fagin: the man who runs a gang of child pickpockets. It could be the perfect fit for a management simulator, where you’re trying to recruit and train children to perform burglaries around Victorian London. You’d need to avoid attention from the police and make sure none of your boys turned on you, but if any kids look like they’re going to turn evidence to the police, there’s always Bill Sykes to shut them up for you. How about you? What public domain books would you like to see turned into games?